Your soul has lived many lifetimes, sometimes in the hundreds. This deck is used to help you bring forward memories of those lifetimes. They can help validate any reoccurring themes your soul has been experiencing. Many times our soul will reincarnate with other souls we have connected with in past lifetimes. Sometimes these are past loves, or are brought to us to heal karmic imbalances. Past life recall can be an important step in healing our souls. It is important, however, that we don't dwell on the past. We simply want to use the knowlege in a way that helps us better ourselves in the future. Archangels are servants of God, and each one was created for a special purpose. The Archangel of Healing is Rafael. Rafael's name literally means "he who heals" or "God heals". The beautiful thing about archangels is they are non-denominational, meaning they will help anywone regardless of their beliefs. All you need to do is pray for their help. Many pray to Rafael in their times of sickness; whether physical, emotional, or mental. When Rafael does help, he often guides you in unexpected and creative ways. It is important to not as for a specific outcome, as many don't really know the best way they can be helped. You may think one method would solve all your problems, but as humans we can only comprehend so much. As a divine being archangel Rafael can guide us toward the best way to heal ourselves. Archangels do not interfere with a person's free will, so it is up to us to listen to his message and follow his guidance toward healing ourselves. Ultimately it is up to us whether we heal or not. This deck will show you what Rafael asks you to do, and understand is messages. Before birth your soul worked with other angels, your spirit guides or guardian angels in a sense, to create a purpose for your soul to fulfill while on earth. This purpose gives our soul a mission to grow in ways it hasn't yet experienced, or may have been unable to complete in past lives. When we are on a path to fulfilling this purpose we are happy and healthy, with a feeling of accomplishment. Often we carry a positive attitude that affects everything around us, making it positive as well. Finances improve, relationships are strong, and our life takes on meaning. When we are not on the path to fulfilling our mission depression and anxieting kick in. The things we do become monotnous and mundane, even if it was once something we enjoyed. This deck can validate what you may already know is your purpose in life, or may even open your eyes to new paths you never thought possible. Our angels guide us in our everyday lives, but often times we are oblivious to their presence. On occasion we ask them to come foreword and guide us in difficult times, when we feel we don’t have the strength to continue, or maybe a decision has to be made and both sides seem relatively equal. They give us subtle signs that we sometimes miss as coincidence or are unsure we should trust our instincts to follow these signs. This deck contains clear signs and guidance from your angels to help guide you through these times. “Where is my soulmate?” “Is this really the person for me?” These are the questions we ask ourselves the most, and it would help us so much to put our minds at ease with a little insight into our romantic relationships. 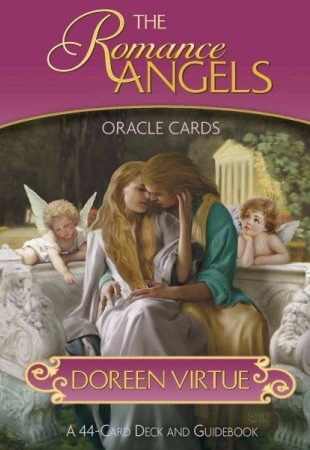 Whether you are romantically involved or not, these cards will bring you the messages the Romance Archangels Angels Michael, Jophiel, Chamuel, and Rafael want you to know.